Updated at 10:51 a.m. with a statement from Esty’s office. Washington – A conservative watchdog group, the Foundation for Accountability and Civic Trust, filed a complaint Thursday with the Office of Congressional Ethics requesting an immediate investigation into Rep. Elizabeth Esty’s handling of a former chief of staff accused of abusive and threatening behavior. The Office of Congressional Ethics, or OCE, serves as an independent watchdog to vet or screen ethics complaints against lawmakers and congressional staffers for the House Ethics Committee. After screening the complaints, it issues reports to the committee on whether those matters should be pursued. Because Esty, D-5th District, already has asked for a direct, expedited Ethics Committee review, it is unclear whether the OCE will investigate this issue. It does not comment on complaints it receives. “Rather, she kept her chief of staff employed in that position for three months, allowing for a hostile work environment to continue,” the complaint said. “Shortly after the harassment and threats of violence were substantiated, she wrote a positive letter of recommendation identifying his ‘keen political judgment’ and ability to ‘develop relationships’ indicating either her chief of staff’s behavior did not affect her opinion of him or she was not honest in her assessment,” the complaint said. FACT attached several news stories and releases from Esty’s office to back up to its complaint. Esty has apologized and admitted she mishandled the situation and was directed by the House Employment Counsel to take the steps she took to dismiss Baker. 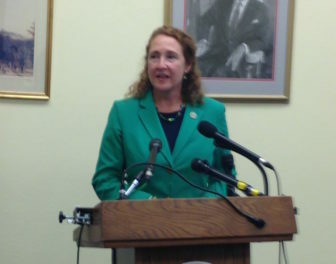 Esty announced this week she is retiring from her congressional seat at the end of this year. If the Ethics Committee does take up the FACT case but does not issue a finding by then, it probably would drop the case since it would no longer have any jurisdiction over her. FACT has filed complaints against a number of lawmakers, mostly Democrats. But it also asked the OCE in 2015 to investigate whether Rep. Mark Meadows improperly paid a chief of staff accused of sexual harassment by several female staffers for months after he no longer worked for the lawmaker. In addition, several female staffers in Meadows’ office complained that his chief of staff, Kenny West, sexually harassed them several months before the North Carolina Republican dismissed him. According to the OCE, Meadows’ office told West in October 2014 not to come to the office anymore, though he was not terminated until much later. The case is currently under investigation by the House Ethics Committee.